Outbreak Dread the Undead SC is a Haunted Attraction located in Myrtle Beach, SC. Team Jefferson Starship reviewed this attraction on October 28, 2016. 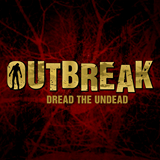 Outbreak – Dread the Undead is an interactive walk-through, hi-tech haunt with locations in both Tennessee and South Carolina. We stopped in to review the South Carolina location, but we are told that both sites are very similar. Furthermore, it must be noted that the Myrtle Beach, SC location is beneath a large wax museum. The wax museum does have a small ‘monsters’ section with displays featuring Hellboy, the Xenomorph from Aliens, Predator, as well as Dracula, Frankenstein, and others. Furthermore, the basement also holds an interactive mirror maze geared towards younger children. It is possible to purchase one ticket to visit all three attractions, or individual attraction tickets. There is one ticket booth that also serves as the cashier stand for a souvenir shop that also sells soda and candy. In short, it is possible to visit and find something for everyone in the family to do. The location is open year-round, so if you wish, you can visit the haunt anytime during the year. For the purposes of this review, however, we are focusing primarily on the Outbreak – Dread the Undead portion of the site except where noted. There is one physical actor inside Outbreak and one costumed attendant outside. Furthermore, there is a video with a number of actors that you watch as the haunt begins. All of the actors are believable; however, there is little direct interaction between the visitors and the actor. The attendant at the door is in costume to add some verisimilitude, but is not really in character otherwise. The video is entertaining and really helps to set the scene and mood for the haunt. The sole actor inside does a good job of providing some individual scares and interactions, but has little in the way of dialogue. The costumes for Outbreak made sense overall and, in general, were authentic. There is a story element involving eye-color and identification of the undead. However, this element was not played out with the physical actor. There could be many reasons for this, but it was something of a let down. This haunt was completely handicapped accessible – something of a rarity for haunts in the region. The staff was very friendly and enthusiastic – from the young woman who sold us our tickets, to the photographer who took a picture of us being carried off by King Kong. Unlike a traditional haunt, there was no line or queue entertainment. However, as previously stated, the entire site houses several attractions if visitors need more things to do and see. Where Outbreak – Dread the Undead starts to really shine is in its props and special effects. The majority of the haunt consisted of detailed sets built around animatronics. Instead of pressure pads, all of these seem to be triggered by proximity and laser triggers. Hands reaching from behind walls, falling cages, rattling doors, and lots and lots of trapped but moaning and thrashing zombies are the center points of detailed set design, allowing visitors to move through and be the focal point in the scenes. The theme of this haunt is, of course, a zombie outbreak from an isolated laboratory. It’s a plotline used in multiple movies, books, and even other haunts. So, while it isn’t an original theme, per se, it is at least carried throughout the haunt from the lab-coat wearing ticket taker to the final explosive ending. There were some very well done (and cunningly hidden) spots where the actor could pop out for scares that caused even our most jaded reviewer to jump in surprise. However, due to the mechanical nature of the majority of the props and effects, typically only the first few people in a group are getting the full effect of the scares. Be sure to keep close together while you go through as it takes a bit for some (but not all) of the effects to reset. We were able to move through Outbreak in 10 minutes; though it would be possible to move through slower, we stayed moving at a steady unhurried pace. Single tickets for adults for Outbreak are $15, which comes out to $.66 per minute of zombie-lurching fun. The all-access pass which gives visitors entrance to the wax museum, mirror maze, and Outbreak are only $28 for adults. Given the time you can spend wandering through these other attractions that are on site, we recommend stopping to see them as well and spending an hour or more experiencing everything the site has to offer.